This entry was posted on Friday, January 7th, 2011 at 9:59 am and is filed under The Idiot: 1977. You can follow any responses to this entry through the RSS 2.0 feed. Both comments and pings are currently closed. I’m with you all the way as to the albums that make up the ‘Berlin Trilogy’. ‘Lodger’ (like most lodgers) just doesn’t fit in and gets in the way. ‘Scary Monsters’ saved the day…the ‘last great Bowie album’. I know it gets a lot of flack, but I’ll fight for it to the end: “Let’s Dance” is an excellent album in a certain genre: Dance Pop. Not the most sophisticated genre, but Bowie milked everything it had to offer in “Let’s Dance”. Unfortunately, this left him with nothing worth saying in “Tonight” and “Never Let Me Down”. Well, I agree re your reassessment of which albums make up “The Berlin Trilogy” – but I disagree w/Mr. Watson here, if he’s saying that Lodger’s a poor album. It doesn’t fit the trilogy, true enough – but I think it’s another one of Bowie’s transitional albums, and a very good one at that. I don’t listen to Iggy Pop much – to me, Lou Reed and Bowie have always provided everything Pop could give me and more – but this song is absolutely terrifying. The way Pop’s vocals fade in and out, plus those guitars at the end… I actually shivered the first time I heard it! The lyrics crib a bit from “The End”, though, don’t you think? By now, hopefully you’ve been exposed to Iggy’s “pre-Bowie” band ,The Stooges, and have had the chance to hear what Bowie was drawn to… and was to subsequently respond to…. For the record I think that Lodger is OK but seems to try a little too hard to be cool. Let’s Dance did its thing and I love a couple of tracks but ‘great’? I don’t think so. Soz. These ‘best of’ debates make for great cocktail banter and are a lot of fun. But ultimately is a cheetah better than a bear? I dunno. It’s an interesting re-worked trilogy idea though. of course you ciuld expand to a quartet and be done with the whole thing. The music on the Idiot always reminded me a little of the Mike Leander sound for Gary Glitter’s early records including Rock and Roll (parts 1-2). The recording process was even similar with Leander recording nearly all the instruments (just as Bowie piled on the overdubs on the Idiot) and producing that strange almost Lo-F guitar and drum sound. Great quote and photo at the top. I remember reading somewhere that everybody should find The Doors exciting at fourteen years old but embarrassing at forty. I feel much the same about Iggy Pop – but lower the ages a little. I’ve often wondered what was in this collaboration for Bowie. Iggy Pop got Bowie at his most prolific giving away his best songs. 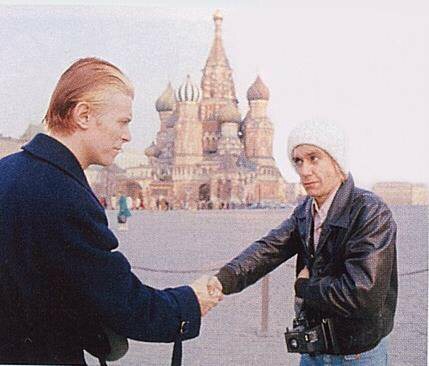 Looking at this photo, the thought occurred that perhaps Bowie’s reward was that he got to hang out with someone who made him look tall. Just a theory. Bowie’s 6 foot isn’t he? I don’t think he particularly needs anyone to make him look tall. I think the appeal of Pop (and for that matter Lou Reed) for Bowie is wrapped up in the concept of “authenticity”. For Bowie, his own inauthenticity is something he simultaneously flags up and celebrates, but is also anxious about. Working with Reed and Pop he somehow coopts their “authenticity” as red-blooded American rockers. How are things with you these days? Still managing to keep a roof over your head? I’m still as careful with my money as ever. A good friend of mine – you may know him, Pat Hewitt – reckons that just as Bowie can be anxious about a lack of authenticity, he has a similar thing about a lack of inches. Is he really 6 foot? Yes, according to early publicity material, but if that’s correct, then his wife must be about six foot three. And for what is worth, Iggy Pop really does sing well on most of The Idiot. No, he is 5’10 (178cm). And I don’t think he’s the type (and neither Iggy, as for the matter of the fact) who would complex on his height. I was surprised for that, because he always looks tall in pictures. Even with people who are bigger than him, he always seems taller than them too. I guess it’s mental superstardom that shows. I aggree with Marion Brent. Iggy just was one of Bowies fascinations. Bowie was always searching for something, he could be anything, so he had to have something to hang on to. Iggy already was someone – a fully developed personality, living his life to the full. What’s with all the Iggy-bashing? I’ll accept that he couldn’t have made The Idiot or Lust for Life without Bowie but he provides that aggressive quality and some great singing. Before Bowie came along Iggy made some great records with the Stooges too so there’s no way anyone can just dismiss him. Lou Reed apparently was fooled by Iggy’s act. Hell, most of us were–I would have never have guessed that he was an honor student in high school! 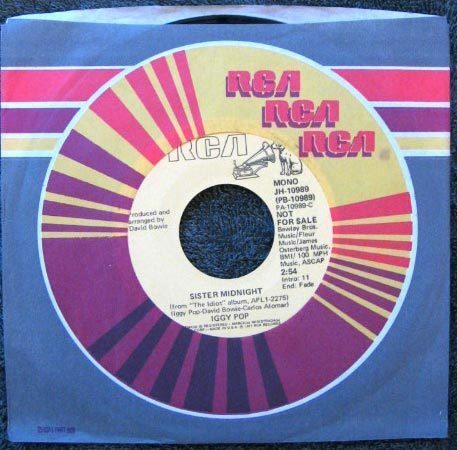 Sister Midnight was also played in toronto on the 1976 tour – bowie decided to play it, on the spur of the moment, because someone threw a book onstage, a book that Bowie had been trying to obtain without sucess. so he decided to play the song in return. I’m glad I’m not the only one who thinks that the true Berlin trilogy begins with The Idiot. Someone has! Namely a remixer called ‘Cygnet’. I have it on my computer but I can’t find a link to it online, unfortunately. Let me know if you want it. Thank you! Yes, I want it, if you dont mind. Sure thing. Just let me know when you’ve got it. I got it man, thank you very much. Reading all this and listening to the Bowie rehersal version makes me think that instead of being a pointer to DB’s future had he stayed in America is it not something that was writtten during the STS sessions but for some reason never made the final album. This year sees the 40th anniversary of STS so in my dreams I see a fortieth anniversary edition with a full STS studio recording of Sister Midnight on the bonus disc. Can anyone enlighten me as to any connection between Sister Midnight/Red Money and ‘Transistor’ by Scissor Sisters on their album ‘Ta-Dah!’ (https://www.youtube.com/watch?v=ZsDMjFQDgcs)? Carlos Alomar is credited with guitar but not writing. The similarity in groove and lyrics is surely deliberate.